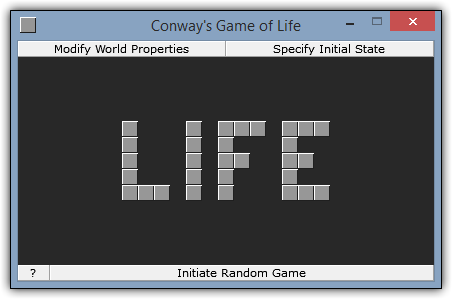 Conway's Game of Life consists of a world of cells on a grid. These cells are either alive (on) or dead (off). The state of cell is determined by a set of rules, which all cells must obey. These rules are applied to every cell simultaneously. The only player input is the initial world state. Conway's Game of Life is played by creating an initial world state (picking which cells are initially turned on) and watching the world behave accordingly to the set of rules. View/Play Conway's Game of Life now!